INDIANAPOLIS, Ind. (Sept. 15, 2014) – Olympic legend and Hall of Famer Jackie Joyner-Kersee highlights an impressive group of Team USA athletes who will conduct USA Track & Field’s RunJumpThrow Experience events as part of the SUBWAY Fit for Life Challenge, USATF announced Monday. 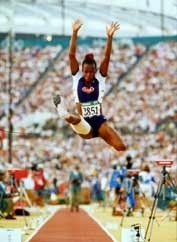 Joyner-Kersee will lead a RunJumpThrow Experience event in Myrtle Beach, S.C., on November 24, the last of four RJT Experience events being conducted by USATF as part of its local partnership with SUBWAY restaurants. USATF also will conduct events Nov. 18 in Charlotte, N.C.; Nov. 19 in Asheville, N.C.; and Nov. 21 in Columbia, S.C. RunJumpThrow is a hands-on learning program that gets kids excited about physical activity by introducing them to the basic running, jumping and throwing skills through track and field.